"I couldn't see," Sugar Hart was saying through swollen lips. "I couldn't see and I was scared to move, scared I might move into a punch." 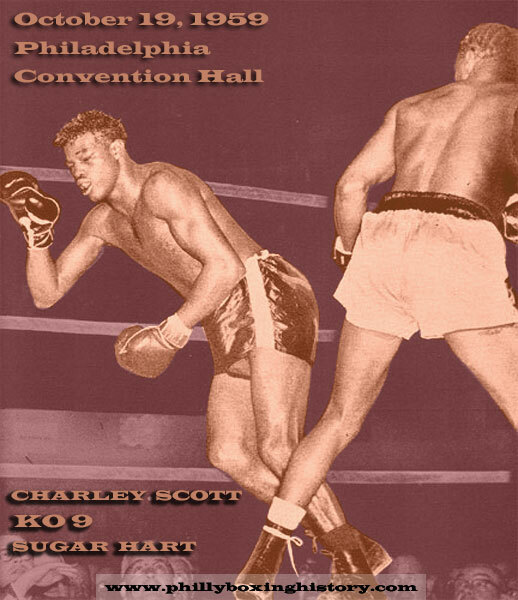 The fight had ravaged his vocabulary, leaving him with hollow and awkward and insufficient phrases to describe the war he had waged with Charley Scott. Scared? No, it had to be something else. There had to be some other reason for Hart to shun his classic skill as a boxer and choose to fight Scott in the cramped and bloody corners of the ring. They fought entire rounds in the narrow bitterness of the corners, ignorant of the referee's presence, oblivious to the crowd. They fought the way they'd have fought in a cluttered alley, or in a dark closet, or on the edge of a cliff. Hart, manager Marty Stein, and trainer Willie Reddish fumbled for the words to explain the tactics of a fight so brutish, so savage it defies analysis. Hart said it best in a touching, eloquent minority statement. "It was my stupidness," he sighed, an ice-pack clutched against the narrow slit of his left eye. I couldn't get started. I couldn't get situated. I thought I might hit him with one good one and drive him back. I hit him good shots, but I couldn't drive him back." The reality of defeat hadn't seeped through the pain. He seemed to be talking about two other guys, nodding his head at the drab condolences like a distant relative at a wake. "I didn't feel as though I was hurt. But the judge knows best and he stopped it. I was worried about my eyes." Reddish groped for words. "Every round he said he'd try to go out and box him, and he'd begin every round that way. Then he'd fall into the inside. The only other time I can remember him doing anything like that was against Charlie Cotton. For three rounds, he wouldn't do anything we told him. Then he snapped out of it in the last two rounds. Maybe it's just that it's easier to fight inside. Boxing is hard. Maybe that's why he stayed inside." Stein paced restlessly in the crowded room, his handshake limp, his fingers sticky with the superstitious lollypop he had clutched through the fight. "He didn't do what we told him to do. We told him to hit from the outside only. We told him when he got in close to grab and hold him." "After five years as a pro we didn't think he'd lose his head and let his ability go by the wayside. Hart's a beautiful boxer, a heckuva fighter. Maybe he's just got too much guts. I wanted to stop the fight after the eighth round, but he just looked at me and said, 'You'd better not do that, you better not do that.' He didn't fight his fight. But Scott may have had something to do with that. All I can say is, there'll be another night." Scott's manager, Norm Henry, his voice raspy with joy, agreed that Scott was a vital factor. "In a fight like this, usually neither fighter learns anything. But Charley was learning. He was going to school out there, thinking . When he saw his right hand was hurting Hart, he doubled up on his right hand, the first fight he's even don that. Scott's stubborn, determined. He's a man." The circle around Hart widened and closed again. The question hummed like a pesky mosquito in the air, troubling everyone. Why did you stay against the ropes? Why? "I thought," Hart whispered slowly, "I thought I would take the heart out of him that way." Stan Hochman wrote this column for the Philadelphia Daily News on October 20, 1959, the day after this historic fight.